Most people ask their self the question 'What the heck is this stuff ?' when they see the name of the product. Well Mouse Wax is not really a wax. It's an water based non-toxic, semi-opaque liquid that has no real wax or petroleum product in it. Mouse wax is wet, but it's DRY. 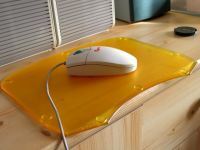 Mouse wax is designed for kind of mouse pads and mice including optical and ball mice. As with all household chemicals, keeps out of reach of children, and do not ingest! 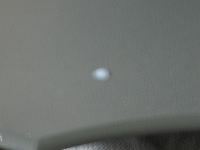 Unless you play computer games that require fast, accurate, and precise movements, you might not appreciate, at first, the need for Mouse Wax to be on your pad and mouse. 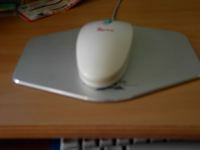 However, Mouse Wax thinks that any computer user can benefit from the reduced drag and friction between the mouse and the pad. When you use the Mouse wax it does feel that your mice is sliding on ice! You get a tube of Mouse wax, a sponge and a Q-tip. 1. Clean the pad first with warm soapy water, and remove any debris and dirt. Let dry. 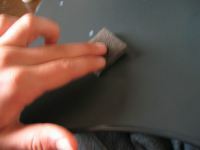 Vacuum or sweep cloth pads before applying. 2. Place a dime size puddle in the middle of the pad and wipe around evenly in circles with small damp sponge. 3. 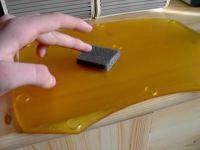 Certain gaming pads require the use of a sponge( included) to evenly coat the pad with the liquid. 5. Blow dryer may be used to cure the wax quicker on the pad. 6. 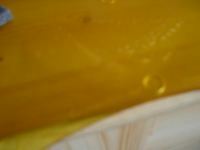 Full cure is 24hrs, but the wax may be used effectively in minutes after treatment. Full cure treatments are more durable. 7. Very little is needed to do the job so Less is more when it comes to treating the pad. 8. 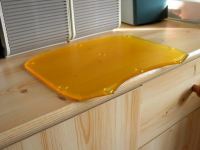 You don't want to gunk up your pad with lots op Mouse wax. Gaming pads require texture. 2. Clean mouse feet with finger nail of other tools. Wiping off any debris and all black gunk. 3. Use Isopropyl or Windex, for really good cleaning. If MouseSkatez have been used, all glues must be removed for proper slickness to be achieved. 4. 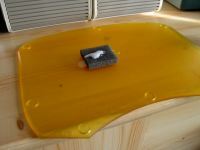 Using the bottle, place enough wax on each mouse to cover the entire foot when liquid is levelled. 5. 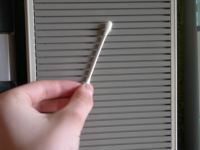 Use damp A-tip to even out the drop out on top of the mouse foot. Let dry a few minutes before use. 6. Keep wax out of optical eye port if you use an optical mouse. If it gets in there wipe out immediately. 7. 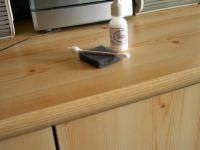 You may also coat the ball of a ball mouse with Mouse Wax to help reduce the build up of gunk on the rollers internally. 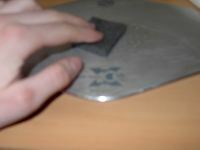 At first, I read the instructions and I begun to test the Wax on the Speedpad. I cleaned the pad with warm soapy water and let it dry a few minutes. Then I wiped around in evenly circles and let the liquid dry a few minutes. The liquid looks like sperm, but it isn't sperm :p . I let the pad dry for an half-hour and I tested it. And indeed, it feels like your mouse is sliding on ice. Fantastic effect! 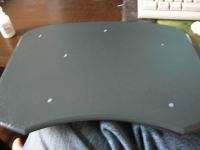 Then I wanted to test if the wax also works on the Aluminium Mouse pad of Coolermaster. I did the wax on the pad, but it won't dry. So I went to the bathroom, cleaned it with water and dried the pad. I was really surprised when I tested the pad. Not so much effect as on the Speedpad, but you were sliding much faster with your mice. Now it's time to test the liquid on the mouse ;). I turned the mouse upside down and I cleaned the feet's. Then I put the liquid on it and waited a little. After that I took my ball out of the mice and I coated it also with the Mouse wax. I waited another 30 minutes and the effect was even more wonderful. On the steelpad and on the aluminium pad, I was sliding even more quickly than before. The product works really ! First I was a little sceptical if this product could really improve my 'mousing expercience'. 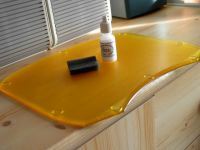 I put some of the Mouse wax on my black Speed-Pad and dried it with the sponge. 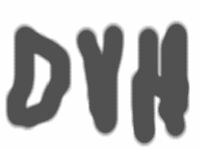 I invented a quick test to test this product with 'Paint Shop Pro'. 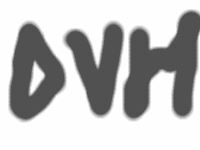 I drawded the letters DVH thee times with a grey paint brush. First without Mousewax, second with Mousewax 5 minutes after that I applied it and the third one is 30 minutes later. The test was done with the Logitech MX700 mouse on the black Speed-Pad gaming pad. Without the Mousewax I could draw it easely. After the applyment of the Mousewax I had some problems drawing it because my mouse glided and slipped to much. It was gliding a lot better than before, but it was a little too much, so I couldn't really perform accurate tasks without problems, like selecting or clicking on a small thing, the mouse always glided a little bit to the other side. Thirty minutes later I was able to draw the letters almost as good as before the applyment of the Mousewax. 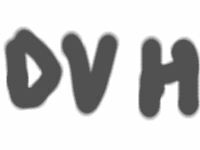 I'm not really a gamer, (I've spend a lot of time working on DV Hardware last few months), but I tested it in a few games and I could conclude that in games it really gives a benefit. 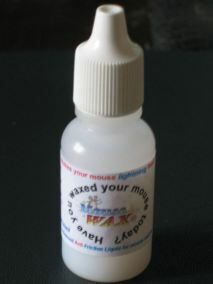 Mouse wax makes sure your mouse is slicker than before. Just put the liquid on your mouse pad, and on your mice and the result is a lot better gliding! It works on all sorts of pads an mice. 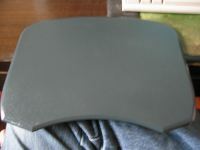 You can use it dry and it doesn't change the look of the mouse pad at all. However sometimes like when you've just applied it, it gives you a little bit less accurate mouse performance because of the extra gliding. You have to get used to it. The Mouse wax receives a 7/10 from Darkvision Hardware!